It was a busy ‘end of season’ weekend for both the adults and junior sections of Alnwick Triathlon Club last weekend. Firstly the club are extremely proud of Millie Breese who took part in the Inter-regional championships. 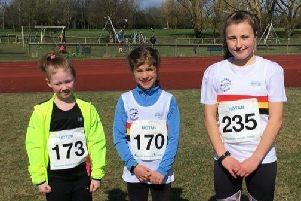 The British Triathlon U20’s Festival is the pinnacle of the season for triathlete’s aged 11 to 19 and has become a key milestone in the development of future triathlon stars. The event is held at Mallory Park Leicestershire and was a tough course. It’s a testament to Millie’s dedication to training which resulted in her competing in this race. For their last race of the season Chris Calvert headed to the west coast of Scotland for a fundraising event. Called the Traighathlon because of its location there was a sprint and Standard distance races. The day broke wet and very windy, resulting in the swim course being reduced from 1500m to 1000m. After a briefing and entertaining group warm up on the beach involving a mix of highland dancing and stretching Chris was off. A mixture of four adults and eight juniors raced at Lakeside aquathlon, the juniors leading the team with some excellent performances. In TS2 Max Murray-John and Harris Hall both had great races, coming third and fifth respectively. For the TS2 girls, Beth Carragher and Eleanor Heeley were up for Alnwick, finishing an excellent second and sixth place. In TS3 Finlay Wilde and James Carragher raced hard to finish in third and seventh. In these 2 categories it was great to see first time podium positions for Max, Beth and Finlay. In the youth category Ben Murray-John and Max Breese battled it out as usual and finished an excellent second and third. Only female athletes in the adult category for Alnwick. Frances Wilde (fourth), Justine Norman (fifth), Rachel Heeley (seventh), Fiona Carragher (eighth). A successful days racing, particularly from the juniors and a great end to the season.